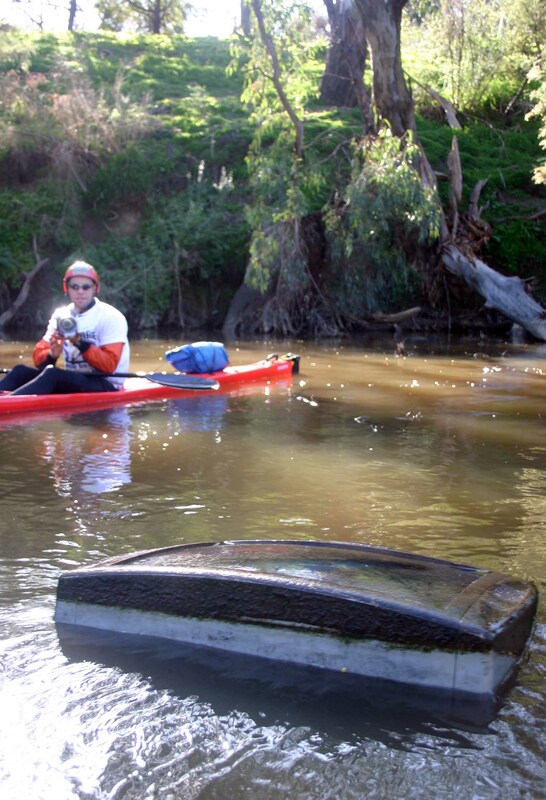 Contemplating the paddle down the Yarra before setting off, I imagined that we’d find a pristine (or close to) environment up in the headwater and as we floated down it would progressively get worse in terms of cleanliness. Turns out rivers don’t work in such a predictable fashion, especially when you’ve got civilisation encroaching on their banks. The paddle today began from the docks of Westerfolds Park, seen off by Mike, the Parks Vic Ranger who has seen his share of theYarra from a Canadian (he tells a great story about hitting unexpected rapids back in the seventies). The stench matched the offputting sight before us. In fact we were told that there is a sewage station where there exists an overflow – when it gets high enough, that’s raw effluent into the river direct. The stretch lasted roughly 10-15km before a magic line appeared once more and the river cleaned up. The difference? Much more remnant growth on the riverbank, a wider river, fewer willows and…parks. 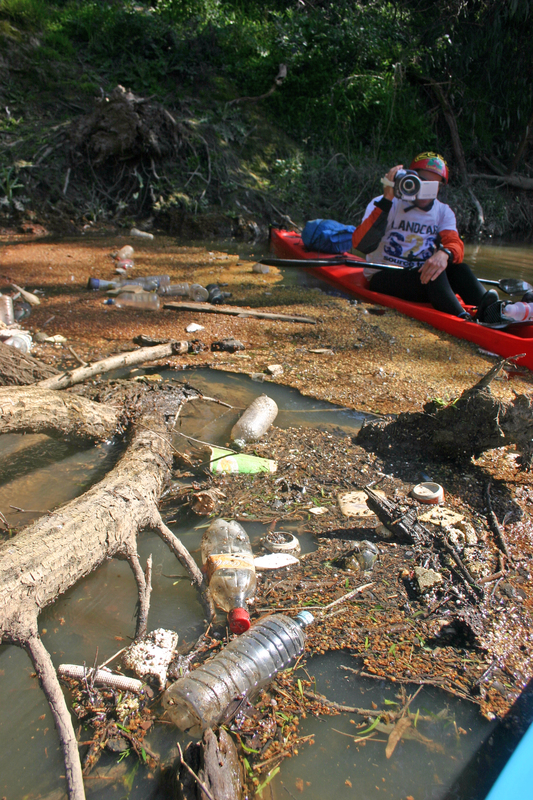 Buffer zones along the rivers edge are, our observations would suggest, pivotal to the health of a river. Not just any old vegetation mind you, but native, mixed species. Willows choked the river higher up, while other non natives changed the ecology of the undergrowth, upsetting the natural balance needed to sustain wildlife seen and unseen, large and small. Back to the positive and as we hit the Burke Road Bridge we met up with Stanley Barker, the founder and sole member of Friends Of Bourke Road Billabong. Under the bridge is a section of crown land long neglected but as our wander showed, rather tranquil amid new growth eucalyptus and the like. Unfortunately weeds have taken hold, not to mention uncaring BMXers wreaking havoc by building makeshift dirt ramps. Riding through on his bike one day, Stan decided the patch needed a friend and he was the man for the job. Not that he’s a loner, our Stan. He wants help. He needs it. But bureaucracy has for the past year or so held up the paperwork as Stan tries to get approval to recruit other Friends of the Bourke Road Billabong. 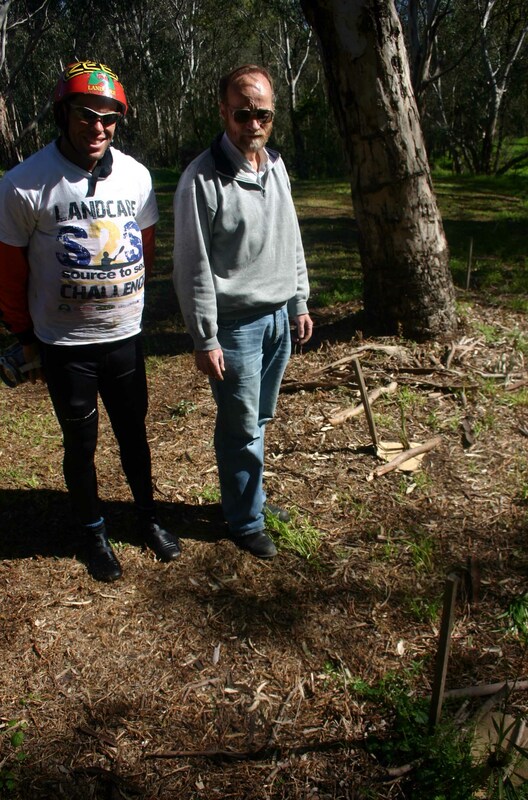 Stan typifies the determination and unending energy that landcare volunteers have in common. Yet another Landcare Hero working along the Yarra, unsung, but by those who walk, run or ride through his patch, much appreciated. We encourage locals to sign up to his cause so that when he does have all the boxes ticked by those working behind desks, he has someone to get his hands dirty with. grin and love it...the man is KEEN! and dragged my boat around. Not Jarad. Remember Team Leader Jarad? The exuberantly madcap pro sportsman who eats up adventure kilometres in his sleep? 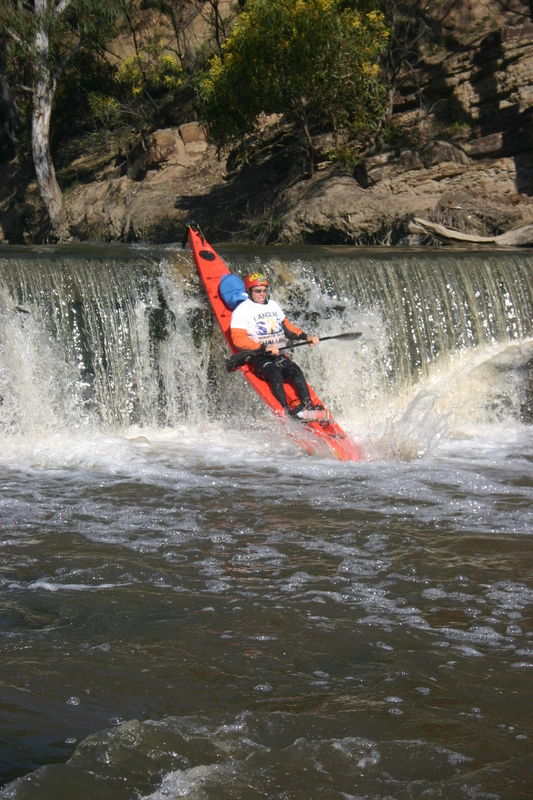 He took a look, punched his paddles through the water in a flurry and soared over the edge. His smile in doing so was nearly as big as the drop. Nearly. He hung in mid air momentarily before plunging down, whacking into the bottom of the river but sticking it, hardly a drop of water on him. Still smiling. He’ll be talking about that one down the pub for a while to come. With so much testosterone pumping down the river it was time to ease the adrenaline with some coffee and scones at the Collingwood Children’s Farm, a unique inner city experiement in urban farming that allows citysiders a taste of the country, not to mention an educational experience in where food actually comes from (oh how we forget when at the supermarket shelves – Coles of course). While munching away, farm staff Briget, Alex and Andrew explained how the farm hosts schools, volunteers, guests and farmers’ markets, produces its own organic goods and – importantly for the fact that they are located on the river’s edge – has just started developing a water garden to filter all their water run off before it hits the river. They will monitor the water before, during and after passing through to see the cleansing effect and ensure they aren’t adding to any of the Yarra’s woes. If they get it right, they’ll be a small scale model for some of those farms further upriver demonstrating how agriculture and nature can work together sustainably to maintain river health.